Digital and mobile technologies give – but they also take away. Leaders of organisations need to play an active role in designing workplaces that encourage the adoption of healthy technology habits. 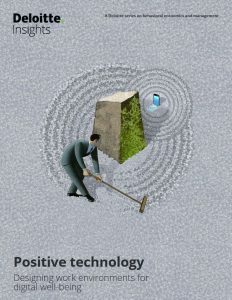 Such is the thrust of a recent paper entitle ‘Positive Technology’ (read it here) by Deloitte. Ensuring that the organisations leaders openly display healthy and balanced technology habits. The article is an important contribution to current discussions on the role of technology in the workplace, where the speed of technology adoption and change is outpacing effective workplace practices and culture. By being reminded of this issue, we are now in a position to choose to care for our employees more than we care about technology. This entry was posted on Wednesday, July 18, 2018 at 3:37 pm	and is filed under Change, Culture, Employees, Technology. You can follow any responses to this entry through the RSS 2.0 feed. Both comments and pings are currently closed.